With so many people using MyAppSales regularly I figured I’d spend a couple of hours working off tickets on the bug tracker. The most important one was causing an app crash if you had sales in one of the newly opened up app store countries. Apple’s double standard was shown to me once more, spoiling an otherwise beautiful Sunday. CXI Gaming was able to sneak iSales Tracker past Apples SDK Agreement and got approved within 2 weeks. How unfair is that?! I mailed Apple the link and and also resubmitted 1.0.1 just to nudge them once again. I also mailed CSI Gaming congratulating them on their luck and advising them to enjoy it while it lasts. The author of Sales Report told me that his first big update got rejected. Most likely the same will happen with iSales Tracker. So customers who first shell out 15 Euros might never get any updates. I finally got my Frenchy to translate the UI strings for LuckyWheel. Also we put in some Dutch “modernizations” because a Dutch review site had complained about the style. Since there where no code changes Apple should be fairly quick to approve this update. NOTE: AppRanking has been deprecated in favor of Applyzer. While other people where looking for easter eggs Michael Dorn searched for and eliminated some bugs unintential easter eggs in AppRanking. What’s new? Adding of your apps is now more intuitive, following the plus and minus paradigm. It’s free, but please donate any amount that pleases you if you like AppRanking and want for Michael to keep improving it. 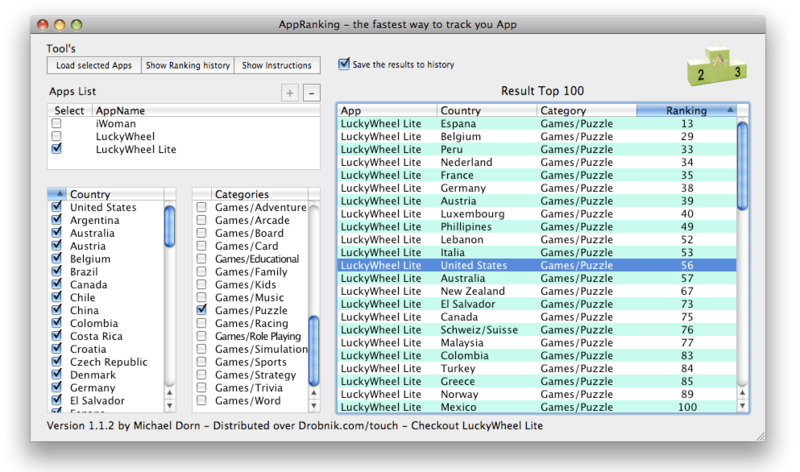 Michael Dorn has updated AppRanking to version 1.1.1 and made it even more WOW. I tried it out with the app ID for iWoman and was rather astonished to see that my app has made it into the top 10 apps of category Health&Fitness in 8 countries. This could happen to you to if you start checking out changes of your app’s ranks with with useful tool. Don’t click on the header to sort the results while update is in progress. You might mix up countries and ranks. But that’s only a display issue, ranks seem to be saved correctly in the history. Note that you can easily select all countries by clicking on the header above the country checkboxes. It’s a ZIP file with an Mac APP inside. Again, like all free software this comes without any warranty. Use at your own risk. 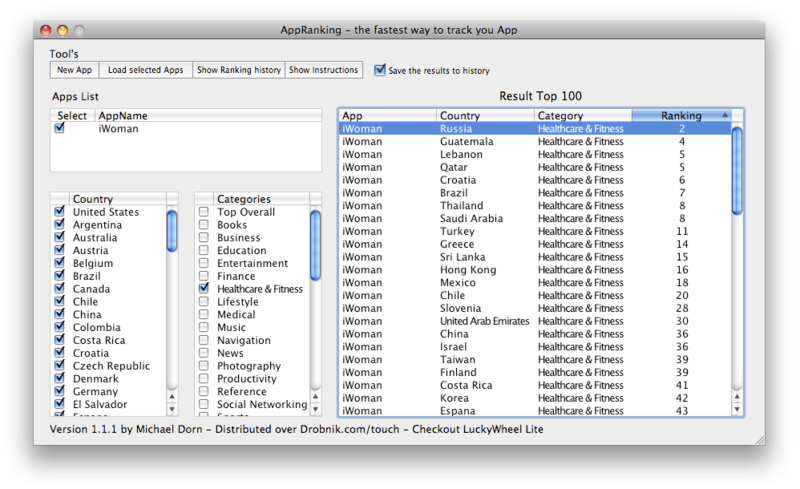 Since we released LuckyWheel 1.0.2 together with a Lite Version we have around 1000 new downloads every day. Of course we are listening to all the user feedback und therefore I am hastily pushing out a new update. This is mostly aimed at the many Italian users, but one change will also benefit Spanish and French players. Depending on how long Apple takes to check it out I guess you will see the update appear in about one week. New Version out now!! Get it before the success goes to our heads and we decide to raise the price. Also, Crazy Mike’s Apps graciously reviewed LuckyWheel and seems to like it, too! “A Cool Game for the Price”. Also as of this version there is a LuckyWheel Lite that lets you play 10 word puzzles in every supported language. <a href="http://www.cocoanetics.com/index.php/geocorder/"GeoCorder 1.0.2 is now publicly available.